Udemy is an online teaching site in which people can pay to learn things like graphic design, web design, coding, and other skills. AWS or Amazon Web Services certification allows you obtain skills that are recognized in the IT landscape (Source). Students take these courses via a website whereby they can watch videos from instructors and read materials to complete their lessons. Lessons can be taken at the student’s leisure. If you’re on the fence about becoming AWS certified, experts recommend you take the plunge because of the rapid growth of Amazon’s Cloud Platform, which means it requires skilled developers, admins and IT personnel (Source). 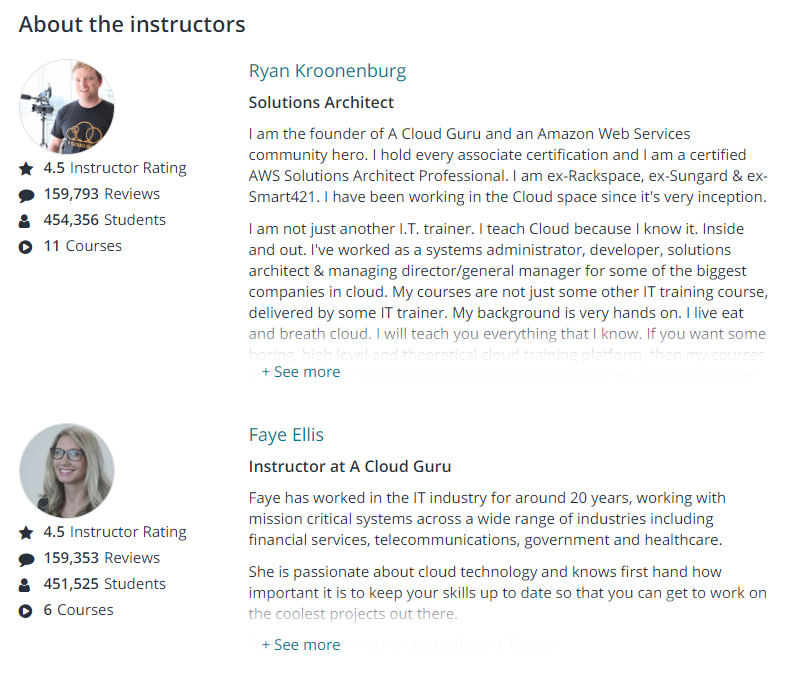 Here we take a look at 5 Udemy AWS courses and compare them. The Architect Associate certification will teach you the skills needed to take the certification exam. For this course, users will need to have access to AWS Free Tier Program and a computer with a modern operating system. Students taking this course said the instructor communicated well, and that the course was easy to follow. However, some noted the course lacked complete demos that showed the “how to” solve various problems. The next course is the AWS Exam Preparation Workshop (*discontinued). 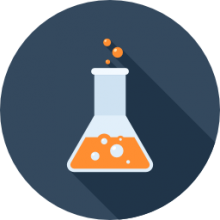 This course prepares you to take the AWS exam by helping you identify and eliminate incorrect answers. Students taking this course must complete the Architecting on AWS course first or have hands-on experience in the AWS program. Users who took this course said the instructor was knowledgeable and clear, and the exam tips were helpful. Up next is the Solutions Architect – Associate Practice Tests course. This course gives you quizzes to prepare you for the final test you’ll need to take in getting certified. Students taking this course should already have taken the Architect Solutions course and need to prep. Users taking this course said that while the course was valuable, there were many questions the course failed to answer. They recommend you read the official study guide in addition to taking the course to be truly prepared for your final exam. The Certified Developer Associate course is the one to take if you’re looking to become an AWS Certified developer. Through this course, you will be able to pass the 2017 developer exam and become proficient in Python and PHP code. People taking this course found it to be useful, but that it needed to be updated for 2018. The last course we looked at is the 2018 ‘All Four Certs’ course, which promises to give students everything they need to be prepared to take and pass all four AWS exams: Certified Solutions, Architect Associate, Developer Associate and SysOps Admin. While this is more expensive than the other courses, it is the most comprehensive. Students taking this course praised the instructor for his clear presentation, but like most of these courses, they said some of the information is out of date because of Amazon constantly updating their interfaces and services (Source). 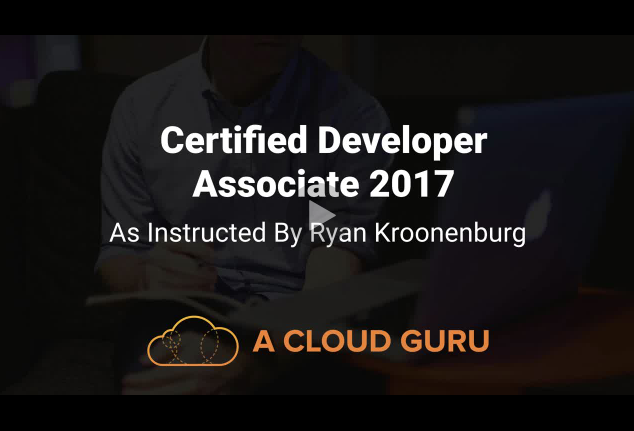 This AWS Certified Developer Associate course by Ryan Kroonenburg and Faye Ellis is efficient, well-structured, and an excellent choice if you want to pass the exam. Students love that the content is well-explained, but some do note that it needs to be updated. The Amazon Web Services Certification training doesn’t require any specific programming knowledge or previous experience, but knowing at least one programming language will make things easy for you. The lectures are between 5-20 minutes in length, and they will help you get familiar with the AWS platform in details. Keep in mind that the tutorials will not teach you how to code. In general, students are satisfied with the quality of the Amazon Web Services certification, and they state that it helped them pass the examination with flying colors. One reviewer mentions that he understood the instructor’s explanations easily and that the topics were well-presented. He adds that he got 78% on the test and that the practice questions are relevant and clear. Another pupil shares that he passed the examination even though he had no previous experience and that he would recommend it as one of the best AWS Certification courses. However, some students have noted that the content is not up-to-date with the current examination. Some also complain that the instructor is too fast and that he doesn’t explain all the terms. 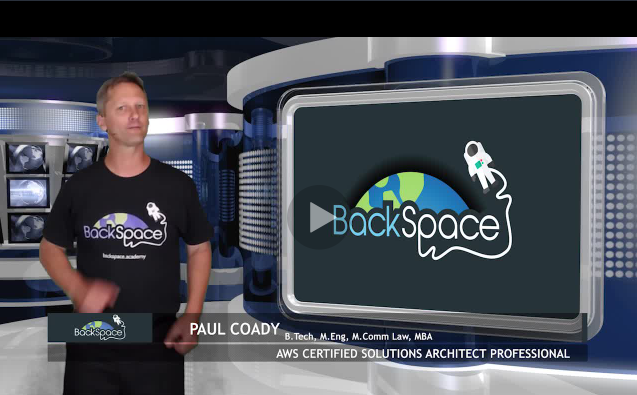 If you’re looking for an extensive course to prepare you for the Amazon Web Services exams, you can take a look at this one by BackSpace Academy. Students love the practical lab sessions, but some do note that it might be hard for beginners. The lessons will help you get ready for four AWS certification exams – Certified Solutions Architect, Certified Developer Associate, Certified SysOps Administrator Associate, and Certified Cloud Practitioner. It includes theory video lectures, hands-on lectures, detailed lab notes, practice test and four certification practice exams. The great thing is that these practice tests will expose you to the type of questions you can expect on the examination. You need a basic understanding of computers and networking to complete the course. A reviewer comments that the lecturer has a nice teaching voice and that the provided documentation is well-written and information. He adds that he highly recommends it as one of the best courses for serious developers. Another student remarks that the content is well-structured and that the quizzes cover the topics. But he warns that not all questions have references or explanations. A pupil also mentions that he passed his Solution Architect test on the first go. However, a couple of pupils have noted that the material is not up-to-date and that there are questions in the quiz not covered in the lectures. These Amazon Web Services practice tests, designed by Rajesh Daswani, are perfect for those who have completed a course on the matter and would want to check their progress. Students love the well-organized structure, but some do note that a few questions don’t have enough reference and that they are too vague. The course includes three practice tests as a final step before the SCA exam, and the questions are based on the supplemented reading in the A Cloud Guru course. Because the technical information might have been updated, you must refer to the provided documentation. A pupil mentions that the practice tests are well-made and that they include all the necessary information. He adds that he passed the SCA certification exam with no issues and that his score was close to the one on the practice test. Another student observes that almost questions have explanations when you give the wrong answer and that they are on the same level as the actual exam. Another reviewer comments that the instructor is knowledgeable and that he presents the material well. However, some have noted that not all questions are relevant to the exam and that some are incorrect. A couple of pupils also state that the actual exam is much more difficult and that there are not enough scenario based questions. If you want to learn more about the AWS Certification exam, this course, designed by Rajesh Daswani, might be useful for you. Students love the length of the lectures, but some do note that it’s not as good as they expected. The lecturers will help you apply the concepts you have already learned, identify/eliminate incorrect answers, and familiarize you with question types. What’s more, you’ll get a chance to learn more about the exam’s structure and time management strategies, which will be useful during the test. However, keep in mind that this is a revision course, aimed at those who are already familiar with the AWS platform and concepts, so it’s not a beginner tutorial. In general, reviewers have a favorable opinion of this AWS Certification Exam Preparation course, and they find it informative and useful. A student comments that the lecturer has a nice diction and that you can understand him easily. He adds that you can listen to the lectures while driving and that he likes that the course is 6.5 hours. Another pupil shares that the lessons provided him with useful tips for the AWS exam and that the information is well-presented. However, one student mentions that he finds the material too difficult to comprehend. This Amazon Web Service SCA Associate course, designed by TELCOMA!, is a comprehensive, well-structured, and useful for learning the basics. Students love the practical questions, but some do note that the instructor writes too much on the board. The course requires access to the AWS Free Tier Program, and it’s suitable for people with no experience in programming or those who want to upgrade their skills. It includes over 180 lectures, 250 quiz questions in addition to over 50 live practice exercises. You’ll learn how to design, operate, and secure your infrastructure. A student observes that the material is explained in simple terms and that it’s great even for beginners. He adds that he passed the Certified Solution Architect exam after two weeks of preparations. Another pupil mentions that the instructor provides in-depth explanations and that the lectures are easy to follow. He recommends it as one the best AWS courses. A reviewer also states that he is satisfied with the structure of the lessons and that the information is adequate. However, some have noted that there are not enough explanations and that the instructor is repeating herself and doesn’t explain the concepts well. Some pupils also are not happy with all the whiteboard writing and erasing. Amazon Web Service certification refers to a level of Amazon cloud service expertise that an IT expert obtains after passing one or more exams. The Amazon Cloud services provide professional exams and courses in various aspects of IT and cloud technology. The exams are used by IT experts to proof their expertise and get higher bargaining power for their services. If you believe you possess the prerequisite technical knowledge in a certain are you can go ahead and register for the exam on Amazon cloud services. However, the services also provide study modules through which those who need to learn more before taking the exams can study. Most of the courses can be done within two to three months. However, if you are more committed or need more time to study, you can take up to six months before you take the exams. You should only do the tests once you are 100% sure that you have the necessary knowledge. For you to be awarded this certificate, you must complete at least one of these exams successfully. For you to get this certification, you are required to demonstrate knowledge of design, management, and distribution of applications based on the the web services tools. As a professional, you will be required to develop high scale systems as well as cater for their security, troubleshooting and disaster recovery. It is recommended that you have at least one year of experience before you can take this exam. This is a code level exam. You should prove your knowledge at code level in development and design of these applications. You will also be required to prove your knowledge of the architecture. It is recommended that you have one year of experience with these applications. This requires knowledge of the basic system administration skills, system management skills, and system administration skills in security. You will also be required to prove your knowledge of the architecture. This includes data mitigation and application development using these tools. You must be a certified Solutions Architect associate for you to take this exam. It is recommended that you have at least 2 years experience in designing cloud architectures before you take the exam. You will be required to demonstrate a professional understanding of the architecture, how to optimize it, how to move AWS and be able to demonstrate application design best practices. You will be required to complete either the Developer or the SysOps Administrator before you can take this exam. You will be required to demonstrate knowledge of various concepts such as the Continous Deployment(CD) and the automation of these systems. Besides these courses, Amazon also offers two specialty courses. You are required to have an Associate-level Certificate and have at least 5 years data analysis experience as well as a background in big data. For this certification, you are required to hold an Associate-level certification and have at least 5 years experience in data analytics and networking.